Thief is a magnificent online video slot machine game from Net Entertainment. 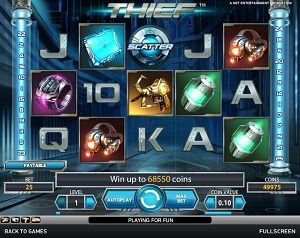 The Thief is Net Entertainment’s newest and most recent online slot game, as it has just been released in January 2013. This video slot game has 5 reels and 25 pay lines. The theme of Thief is about a good-looking female master thief who tries to pull off a high-stakes heist in a futuristic world. What online slots players initially love about this new Thief online video slots machine game is its cool Expanding Wilds! Not only that, this game also has 2 types of Free Spins bonus games in which one of them contains a Diamond symbol that pays out up to 5,000 coins! When you first play this slot game, you will be taken to a world set in the future, where you will be in a street surrounded by tall buildings and enduring the gloomy downpour of the rain. Little did we know that what lies in one of these buildings is a place where there is a vault full of money, highly important documents, jewels and even diamonds! Net Entertainment is very generous when it comes to their wide array of online slots that they typically welcome anyone who is interested to play for free on any of their games (instant play), without requiring them to download anything at all. If you would like to join this slot game’s “thief” on her exploits regarding her current dangerous heist and get the chance to receive lots of different prizes (such as a max cash jackpot of $2,500 and a max coin jackpot o 5,000) along the way, then by all means do so in this wonderful adrenaline-packed Thief online video slot game!. What online slot players can expect from Net Entertainment’s latest video slot is that it is packed with fun and innovative animation graphics and sounds, and great bonus features to make sure that all those who play will totally be entertained with this online video slots game. The Thief looks like a game that is of medium-high variation. You may need to play it for a bit but once you hit a win, you’d get a hefty prize. Most online slots players loved this game immediately the moment they have laid their eyes on it! They say it’s very entertaining and there are many times that you get very lucky even if you have only deposited a low amount. The setting of this slot game is in the future, with tall, dark city walls and a miserable rainy weather. Luminescent blue lights surround the reels. The symbols are drawn very intricately and it shows the complexity of what future technology gadgets might look like. The overall graphic design of Thief displays a wide array of colors, with the main color being blue. They have even used the color blue on their Spin button – Net Entertainment’s usual Spin button color is green. Other colors in the Thief online video slot game include purple/pink, yellow, orange/red, and green. As for the sound, Thief has a constant background sound of the pouring rain coupled with futuristic music. Whenever you hit a win, your rewards are accompanied by celebratory music that sounds like one of those early versions of arcade games. Should you manage to hit 3 or more Adrenaline Scatter symbols, the background music there is much more fast-paced and exciting, making you feel more anticipation when you are playing those Adrenaline Free Spins. The regular symbols are the card deck symbols, 9, 10, J, Q, K and Ace; other symbols that were used perfectly complements the theme of the Thief slot game which include the orange/red Head Lamp, yellow Grappling Hook Gun, a pink/purple Wristwatch, a green Glow Stick, and a blue Tablet Computer. The Wild Symbol is the Thief herself. It functions as an Expanding Wild symbol, which has a useful ability that all slots players love. Expanding Wild symbols automatically expand in order to cover the whole reel they appear on, if it results in a bet line win. The Thief Expanding Wild symbol only appears on reels 2, 3, and 4 in the main game and in Free Spins. The Expanding Wild symbol substitutes for all symbols (except the Scatter symbols). • The regular Blue Scatter symbol: If you hit 3 or more Blue Scatter symbols that appear anywhere on reels 3, 4 and 5 in the main game, you will activate the 10 Free Spins bonus game. You can also activate the 10 Free Spins bonus if you hit any 3 mixed regular Scatter symbols and Adrenaline Scatter symbols. • The Adrenaline Scatter symbol: If you hit 3 or more Adrenaline Scatter symbols, you will activate the 10 Free Spins bonus game + a chance to hit the special Diamond symbol which can give you a nice prize of 5,000 coins! • If you hit 3 or more Blue Scatter symbols, you will trigger the regular Free Spins bonus game where you are awarded 10 Free Bonus Spins. You are then taken to another screen (you will see the hooded female master thief in a blue background) to play your 10 Free Spins. You can also trigger the Free Bonus Spins even if you hit 3 mixed Blue Scatter symbols and Adrenaline Scatter symbols. • If you hit 3 or more Adrenaline Scatter symbols, you will trigger 10 Adrenaline Free Spins. You are then taken to another screen (you will see the hooded female master thief in a red/orange background) to play your 10 Free Spins. In this game, the icons are reduced down into only 4 types: the Thief’s tools (grappling hook, wristwatch, head lamp, glow stick, and computer tablet), Adrenaline Scatter symbols, and the Diamond symbol. The Diamond symbol is available exclusively during Free Spins and it can award you prizes of up to 5,000 coins! Thief has 5 reels and 25 where you may bet on 25 pay lines. The minimum bet is 0.01 coins and the maximum bet is 0.50 coins per line. It’s totally more fun and easy when there’s an Autoplay function available in online slot games. In Thief, you can actually access their Autoplay function in two ways: click on the Autoplay button on the lower left corner of the screen, or you can simply click on the Autoplay button located just beside the Spin button of the game (this is actually a new feature of Net Entertainment’s slots games). Thief can be automatically played as complex or as simple as you would want it to be. In its simple settings, you can choose from 10 to 1000 – these are the number of spins that the game can automatically play for you. If you would like to use a more complex Autoplay setting, just click on the Advanced Settings button and choose to Stop Autoplay when: you win, if Free Spins is won, if Adrenaline Free Spins is won, if a single win exceeds an amount you specify, or if your cash decreases or increases by an amount your specify. When you are completely satisfied with fine tuning your Advanced Settings, just click the Start button and the Autoplay function will automatically help to spin the reels for you.